Low frequency spectrum such as this is especially handy in huge countries such as Canada due to its long range. Canada split the band, which covers 614-698 MHz including the guard band and duplex gap, into seven chunks of 10 MHz. Each of those in turn was divided into 16 regions, making 112 licenses in total. As you can see in the table below Rogers got 52 of those, dropping C$1.725 billion for the privilege. It’s interesting that this is being positioned as 5G spectrum. Unlike millimetre wave, for example, there’s nothing uniquely 5G about low frequency spectrum, so we can only assume the Canadian government made the spectrum available on the condition that it’s used for 5G. Having said that the quote further down from Shaw appears to contradict that. 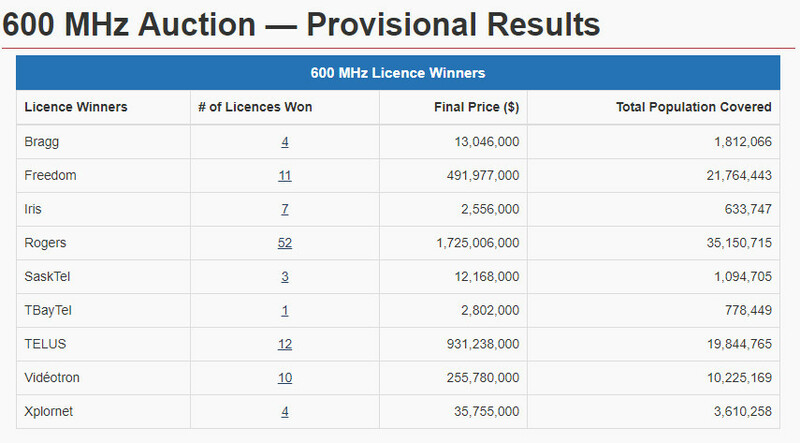 So while Rogers got loads more licenses than anyone else, Freedom Mobile could be viewed at the big winner in terms of cost per population covered. According to Ovum’s WCIS Freedom only accounts for around 5% of Canadian mobile subscribers right now. Judging by the outcome of this auction it has ambitions to significantly increase that share in the 5G era.